Growth is the result of integrating marketing and sales strategies, tactics, tools and technologies around meeting defined revenue goals and select key performance indicators. Marketing functions and activities need to be more focused and accountable for directly impacting the firm’s top line. Bigger, better, and stronger relationships between marketers and business developers need to be structured and aligned. Expenditures for growth need to be viewed in the context of an in investment rather than a cost. Results from marketing and sales activities, strategies, tactics, tools and technologies need to be measured and analyzed. There’s one more ingredient I’d like to add to this recipe: without the right technologies and infrastructure in place, making a cost to revenue transition will be impossible. What Would the Transition Look Like from a Technology Perspective? There’s certainly no lack of technology in the marketing and sales space. In fact, there’s so much available from so many different software companies that choosing technology for business development purposes has become extraordinarily difficult for marketers and business developers, let alone partners. If you want to peek at the marketing technology landscape, check out the Martec 5000 2017 super graphic, here. (Yes ... that’s right … 5,000! In fact, Martec catalogued a total of 5,381 solutions from 4,891 unique companies). In my graphic above, I’ve listed the marketing and sales technologies that I believe to be important for a growth strategy and for making the transition of marketing from a cost center to a revenue center. You’ll notice that some of these technologies are marketing centric, others are sales centric. But what’s important to note here is that combined, they give a firm the ability to do things like track the entire marketing and sales funnel from first website visit to closed deal and beyond, enable marketing and sales teams to share contacts, customer data, dashboards, reports, and pipelines in one place, and give the executive team insights and data on how each marketing and sales asset contributes to the bottom line. I’ve been involved with HubSpot since 2008, and I’ve seen their growth from a fledgling software company into a public company that provides the most powerful marketing and sales technology on the planet. When they started, they were 100% focused on marketing, but over the past couple of years, they’ve been making a transition based upon a recognition that without an integration with sales objectives, processes and tactics, their core platform was in danger of losing the traction they worked so hard to win. That’s why they introduced the HubSpot Growth Stack, and that’s why partners like LeadG2 have been steadily shifting away from solely focusing on inbound marketing to focusing on helping our clients improve their top line by integrating marketing and sales under the banner of growth. HubSpot’s Growth Stack brings marketing, sales and CRM tools together in a single place. From marketers to business developers to rainmakers to the managing partner and executive team, everyone becomes part of a common process, and every action taken feeds back to a unified customer database. 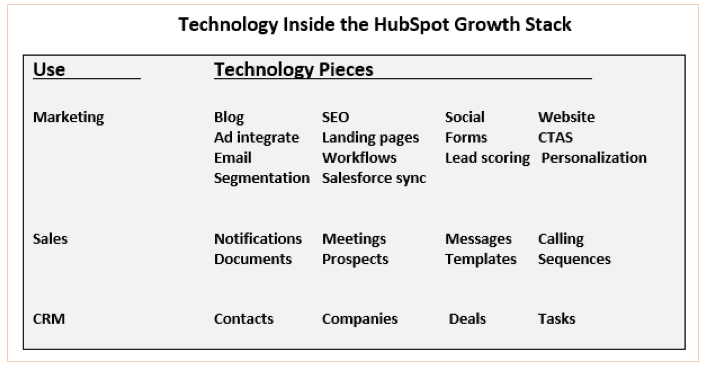 There are several key advantages to deploying the HubSpot Growth Stack, not the least of which is the fact that it’s an all-in-one solution that doesn’t require you to stitch together technology solutions and platforms that may not talk or play with one another in a seamless way. However, it’s important to remember that that the Stack, like all other marketing or sales technology, is just a means to end, and not the end in and by itself. I use the Stack to help support my clients’ growth plans, objectives, goals, strategies and tactics. At the end of the day, it’s a suite of very powerful tools that requires a master mechanic who knows how to use the right parts of the tool at the right time. If you would like to discuss whether the Stack is the right option for your firm, call Dean Moothart, LeadG2’s Director of Client Services at (407) 913-7091 today for a brief discussion on your situation and needs, or send us a message. We’ll stack the odds in your favor.